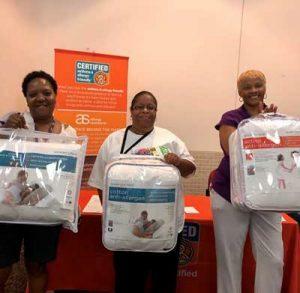 On Tuesday, June 19th the employees of the U.S. Department of Housing and Urban Development (HUD) in Washington DC, attended the “Health and Wellness Fair” to learn more about the asthma & allergy friendly® Certification Program. One very happy winner of an asthma & allergy friendly® CERTIFIED Welspun PRODUCT! It was a fun filled day learning about the impact of asthma and allergies and how to make their homes healthier. Many of the employees have asthma and allergies as well as their clients who they work with on a daily basis. The attendees learned how their home can have a big impact on how well they manage their asthma and allergies. Reducing asthma triggers and allergens in a home should be an important part of a family’s asthma and allergy management plan and with the asthma & allergy friendly® CERTIFIED products and services if makes it a whole lot easier. 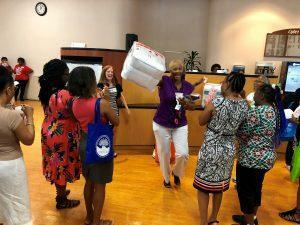 The Certification Program had fun celebrating JUNE HEALTHY HOMES MONTH during the Health and Wellness Conference at the U.S. Department of Housing and Urban Development (HUD) in Washington, DC. The Certification program distributed important educational brochures to the attendees listing the products and services that have been independently and scientifically tested to be better suited for those impacted by asthma and allergies. The Certification clinic wall poster teaching allergy control in the bedroom was also a huge hit among all the employees who were looking forward to sharing with their clients.